On the first ever artificial turf football field ‘Kick on Grass’ a final match was played between Leh United and United Spituk on July 28 near Alpine Villa, Leh. 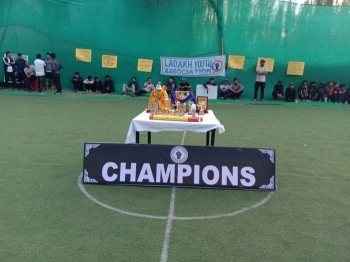 The football tournament was organised by Ladakh Youth and welfare society and a total of 17 players participated. Leh United team won by 4-1 goals. Chief Guest of the occasion, Gyal P Wangyal, EC Sports said, “We are witnessing a football match on a synthetic turf for the first time in Leh which is a very good initiative”. He informed that an office of the J&K Sports Council has been established and soon will be inaugurated. Also , a talent hunt cricket tournament is also going to be held which will be organised by J&K Cricket Association under the aegis of BCCI. The selected players will be sent to the other places for grooming. Jigmet Namgyal, President Ladakh Youth Association and welfare society said, “It has been a year since we have formed this association and organised several events to raise funds to help the differently abled and the needy people. He further said, “We are about 45 members and our main motto behind the futsal is to bring the students to do something productive instead of wasting time in their summer holidays. We request the administration to provide roof above the synthetic turf (football ground) so that the game can be played in winters also. The association also strive to raise awareness among youth about drug addiction and to protect and preserve the environment, culture and heritage.